If you're thinking about going foraging for mushrooms, you might want to change your plans and go apple picking instead. The dangers of eating unidentified mushrooms are legion - and it's easier to misidentify a mushroom than you might think. Here's why you shouldn't eat unidentified mushrooms. There are over 250 known poisonous mushrooms in the world, and they can be more difficult to identify than the most dangerous plants, fruits, and vegetables in the world. If you accidentally eat a poisonous mushroom, you might just have some icky gastrointestinal symptoms, but in more severe cases, you could have a seizure, suffer multiple organ failure, slip into a coma, or even die. Read on for some harrowing tales of times people mistakenly ate mushrooms that contained powerful toxins, and some information about how to avoid the same fate. The symptoms of mushroom poisoning vary depending on the type of mushroom. Some, like the Green-Spored Lepiota and the the Sulphur Tuft mushroom, won't cause anything more serious than an upset stomach. Symptoms typically subside once the body successful rids itself of the meal. Some mushrooms contain the toxin muscarine, which can cause visual disturbances, excessive sweating and salivation, difficulty breathing, irregular heartbeat, and low blood pressure. Muscarine poisoning can be treated with a drug called atropine, and symptoms typically disappear within 24 hours. Some mushroom species have dramatic names like the Death Cap and the Destroying Angel, and for good reason. They contain amanitin, a dangerous toxin that is the leading cause of mushroom related deaths. Ingesting these mushrooms can cause symptoms that resemble a stomach virus, such as vomiting and diarrhea. After a 24-hour rest period - during which many victims are mistakenly declared healthy - serious symptoms such as liver and kidney failure, coma, and even death may occur. It's possible to recover with medication, but in some cases organ transplants are necessary. Victims of amanitin poisoning may also have organ damage for the rest of their lives. When it comes to identifying poisonous mushrooms, it's better to be safe than sorry. That's why one of the most important rules for identifying poison mushrooms is to avoid eating any mushrooms that you cannot identify with 100% certainty. What are the other rules? 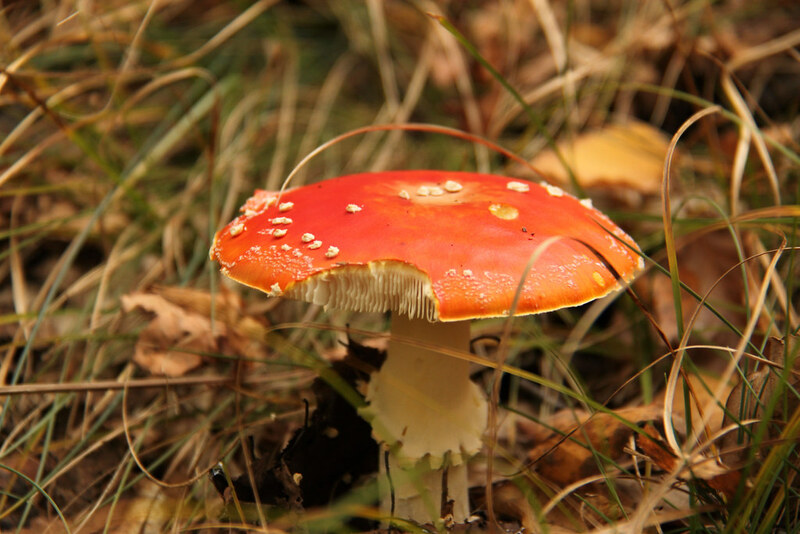 WildFoodUK says that it's important to avoid mushrooms with red caps or stems, and also mushrooms with white gills (the papery rib below the cap.) While these rules of thumb do filter out some edible types, they also filter out potentially deadly fungi, including the deadly mushrooms belonging to the Amanita family. One should also compare any questionable mushrooms to a reputable guidebook. Following these rules does not guarantee that all mushrooms will be safe, but it does decrease risk. "I've seen expert mycologists arguing good-naturedly about whether a mushroom they were looking at was the deadly one. At certain stages of development, the mushrooms can be confused." That being said, if you're not a mushroom expert, and you have even the slightest doubt about whether or not a mushroom is good to eat, you should probably leave it alone. While mushroom poisoning can be extremely dangerous - even fatal - it is treatable. The exact treatment varies depending on what kind of poisonous mushroom. Here's how one of the most poisonous mushrooms, the Amanita, is dealt with. Patients are given IV fluids, which prevent dehydration and help flush the toxins out of the system. They may also be given activated charcoal, which binds to the toxins and removes them from the body. In severe cases, an experimental drug called silibinin may be administered by IV. Penicillin was used in the past, but it is no longer considered effective against mushroom poisoning. In a worst-case scenario, the patient may need a liver or kidney transplant.